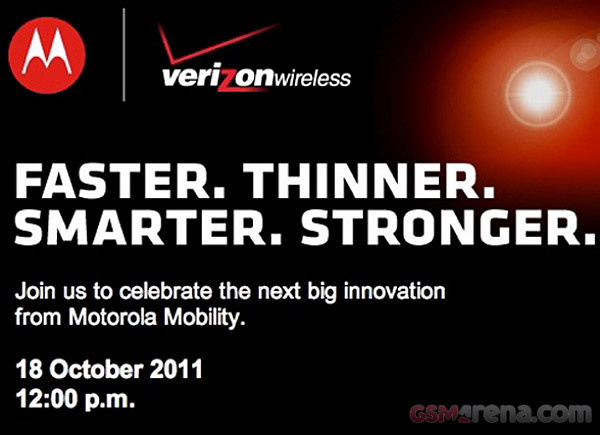 It would appear that something special will be coming out of Verizon and Motorola’s goodie bag later this month as they hint at a ‘big innovation’ to be unveiled at 12pm on October 18th. As the invite suggests, the device in question will be faster, thinner, smarter and stronger than assumedly, whatever its predecessor was. The speculation and rumors floating around have led us to believe that we could see Motorola’s RAZR line revived with the Motorola Droid RAZR (aka. the Motorola Spyder or Motorola Droid HD). Supposed specs include a 4.3″ 960 x 540 qHD Super AMOLED display, which would be an industry first. The Spyder is also expected to be a dual core LTE device (thus Verizon), running a 1.2GHz clocked processor of unknown origin, 1GB of RAM, an 8MP shooter offering 1080p HD video capture with image stablization and even an ‘HD’ front-facer, again with an unspecified resolution. Supposedly the Droid RAZR will have both Gorrilla Glass and a Kevlar frame, promoting that tough image and tying into the bullet theme in the above video nicely, (Kevlar fibers are typically used in bullet-proof vests). There’s every chance however that this new ‘thing’ could be a number of other worthy possibles, such as the next Motorola Xoom Tablet, but to find out, you’ll have to wait and see. Any ideas what you think it might be, are you excited for the Droid RAZR, leave your thoughts in the comments.